My parents and I ended up eating at La Bodega today. We went for our Linner or Lupper or Dunch or Dupper, whatever you want to call it. 😛 We wanted to try something new. 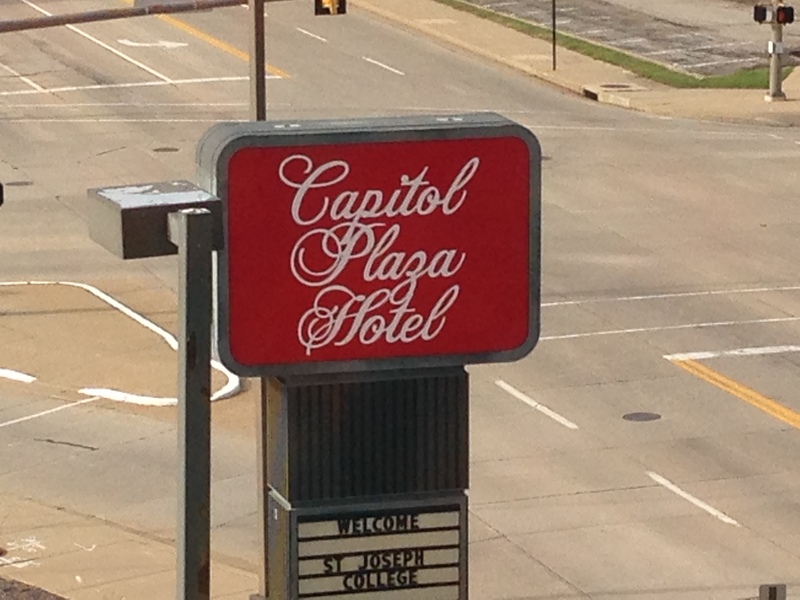 It turned out to be a refreshingly friendly experience from beginning to end. The staff was attentive and nice and our waitress explained everything and found answers to anything she wasn’t sure of on the top of her head. One of our servers was in quite the chipper mood, singing and humming and gentlemanly. La Bodega :: Tapas & Lounge is a Spanish restaurant and at first glance at the menu they serve soups, salads, entrees and most importantly, tapas. Tapas was a new experience for us. They’re like little appetizers you can share with your whole table and everyone gets a little taste of Spain here and there, best paired with something like red wine and a side of good conversation and laughter. We tried a total of five tapas, but I only have pictures of four because I am not a fan of mushrooms, though my parents are and they enjoyed the one with a plate of mushrooms. This is a cold one. It’s basically ham, cheese and bread. But it’s not just any ham! The black Iberian pig roams out in the wild to feed naturally, so it’s basically the best ham on the planet. This was the first thing I tasted and right off the bat I noticed the food wasn’t extremely high in sodium which just boosted its rating in my mind. Yum, yum! 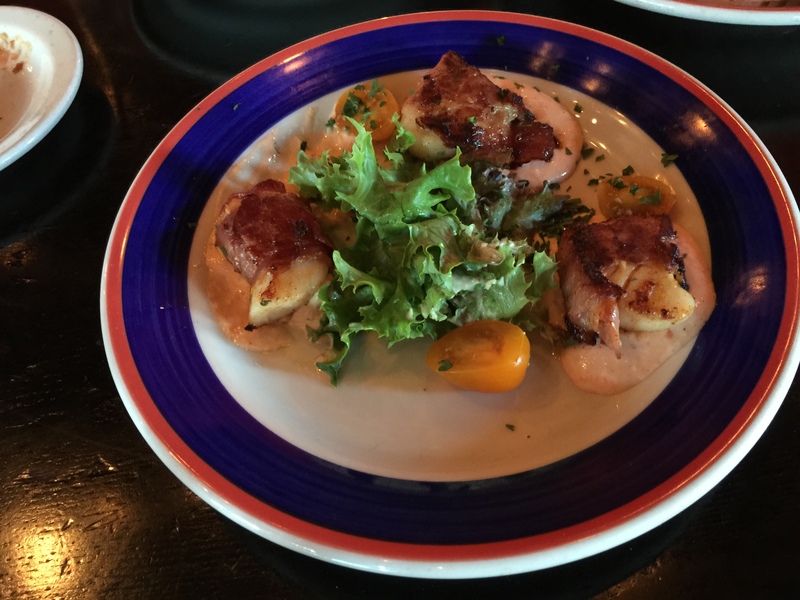 Since our taste is duller than most, I usually expect eating out to be a high-in-sodium experience, but it is simply not so at La Bodega. 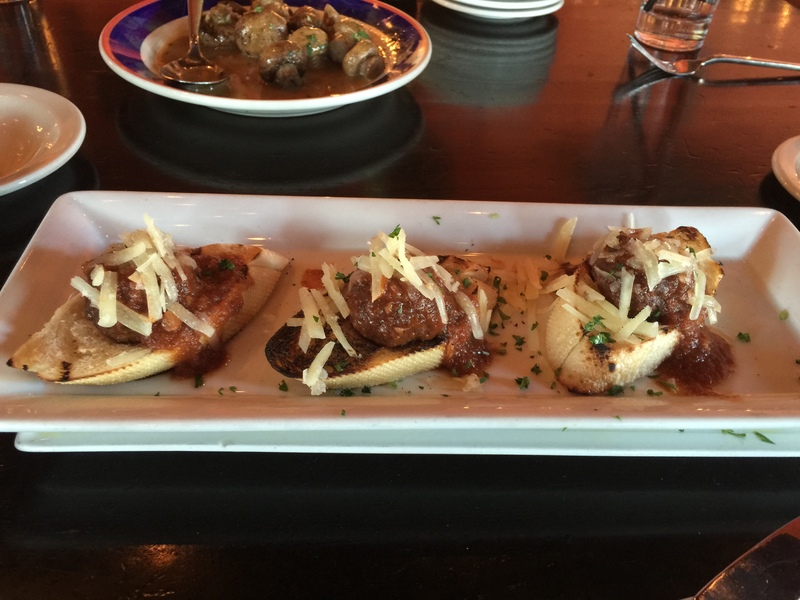 I wanted the meatball in red wine sauce. Also delish, this was a hot tapas. May I just say everything is so artistically displayed? We noticed at this point, even though the dish is supposed to have four of everything, ours came with three since there were only three of us, but they charged us about half the price later so that was super reasonable and awesome! 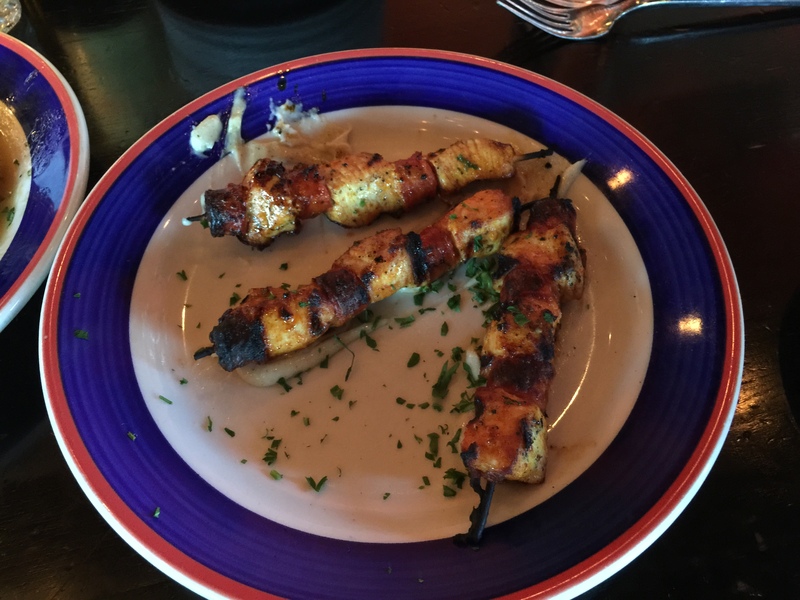 Now I’m not 100% sure on this one, but I know there was chicken on the skewer. The other meat tasted like a kind of sausage. Also incredibly yummy. 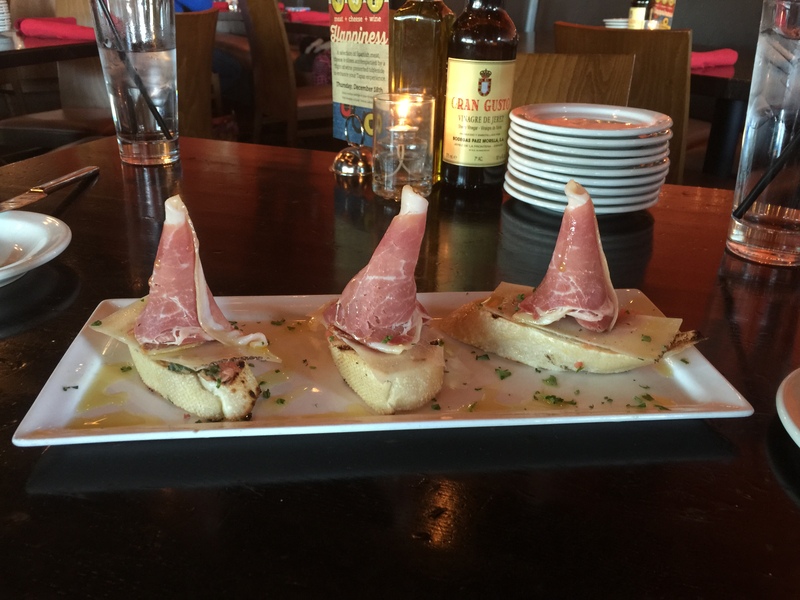 This last featured tapas was my favorite. It was like a mini-salad. I loved the sauce. We didn’t have any bread, but later when my dad’s entree arrived, I stole a couple pieces of bread off his plate so I could dip it in the sauce. I ate the veggies and little cherry tomato and dipped those in the sauce. And those were scallops in the center of the sauce you see there. At this point my mom and I were already filling up. I’m sure if you wanted to just order a soup, salad and one tapas, you’d be good to go. But of course, the fun didn’t end there. There was rice surrounded by seafood. Spanish people are big on that. It loooked like a derivative of the paella. I defintely stole bites off my dad’s plate. 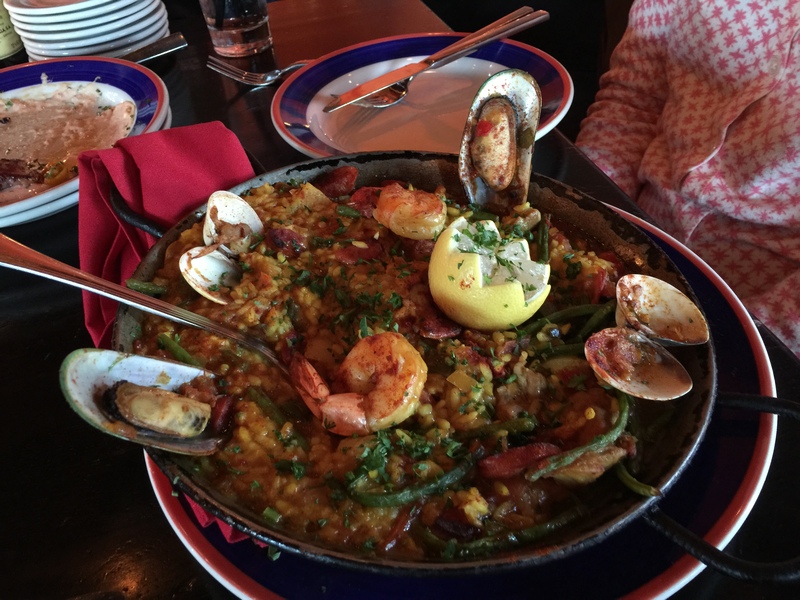 This is one of the most popular paellas and rightfully so. 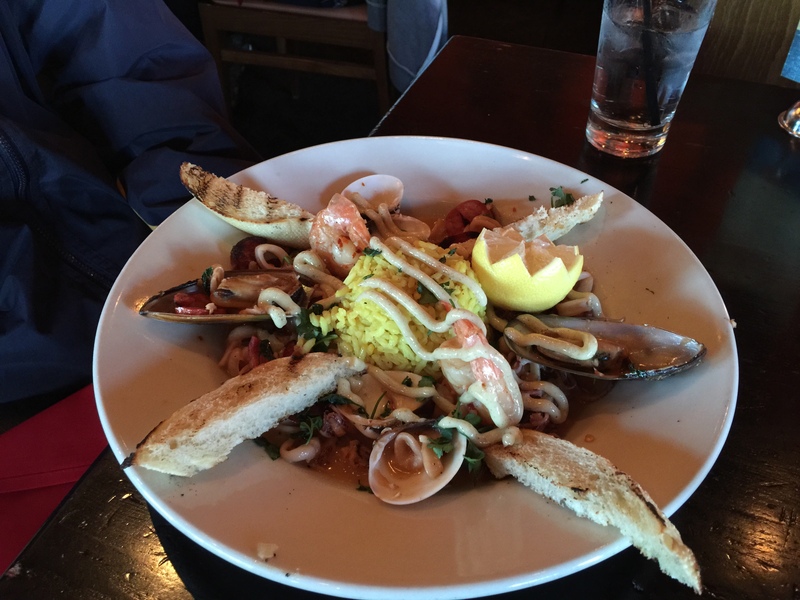 Rice, shrimp, more chorizo (sausage), mussels, clams, the works. Mmm. My mom and I shared this one and we all had leftovers to box up at the end, no room for dessert! 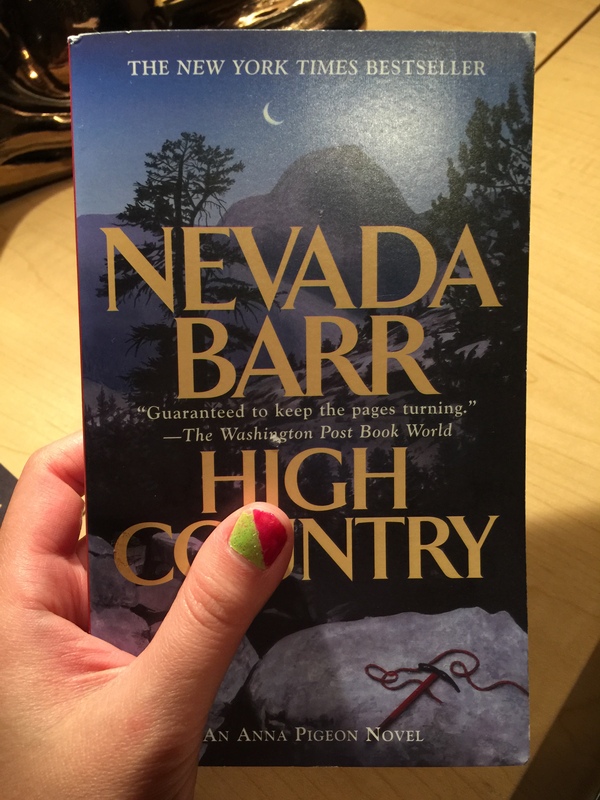 High Country by Nevada Barr was my Thanksgiving read. I’m really glad I read this after my trip to Yosemite because the book does not make me want to go back there any time soon. Barr nailed it with this one. I don’t know too much to add because what she says is so true right here. Something about that transition age signalling the end of your teen years makes you feel invincible. You have everything figured out. The world is not hard to understand. You have experienced just enough to know this, but not enough to know how little you actually know of the world. This is such a beautiful way to kind of personify depression. When it happens, it kind of creeps up on you and all you want to do is clean it up. But sometimes you just allow it to sit there until it piles up. This statement is kind of strange. I think in some ways animals have their own kind of education. They may not call it that, but don’t they teach each other how to survive in the wild? And besides, humans are animals. I have never thought of this before, but Barr makes sense here. I have also never known a sheriff/priest either, so that may explain a few things. To do bad and good and be forgiven all within one person sounds delicious. Another truth by Barr. She was talking about someone accidentally infecting someone with HIV, but guilt can definitely affect someone in other situations as well. I can’t think of any right now, but maybe I’ll feel so bad I’ll come up with a list tomorrow. I just can’t understand how a world exists with such complexity going on in one body. And we’re supposed to all get along? It’s no wonder our world is so broken. Some people want a lot. Some people want to minimize what they have. Some people do not have enough. Different countries operate differently. Groups of people who do think alike like to band together to get their voices heard. I’m not even sure what I’m trying to say right now, but I do think the world is messy, life is messy and we have to somehow figure out how to clean ourselves up to help clean the world up or the world will be trashed and underappreciated and we may go out like the dinosaurs. Now is the time to band together to turn something complicated back to simple. Maybe it’ll be like pretending the world is one big body we have to take care of together. We can’t just give it a try. We’ve got to do it. Earth is our home. We must take good care of it or it won’t just not be our home anymore. It’ll disappear forever. You will be fine again. I promise you will find yourself and you will like it and you will hold onto it forever after that. Forever is a really long time. In fact, an awfully long time according to Peter Pan. Or was it Wendy Darling? It doesn’t matter. What matters is, you will be fine again. Trust me, I know right now you are thinking about him, but it won’t be like this for much longer. You may not get closure, but that’s OK. Closure is overrated. It’s doubtful that anyone who says they have found it really truly never think about their person anymore. Because you’ll still think about him seven years later. Only this time, thoughts of him won’t be hurting you, they’ll be haunting you. Closure? I think not. Right now you are seeing him in the last holiday you spent together that meant something. You are seeing him in that new character on your favorite TV show. You are reading him in the latest book you borrowed from the library for reading you do on your free time. You are hearing his name everywhere and why do so many people have his name anyway? This too, shall pass. It may not seem like it now. Right now you are talking about him to every single one of your girlfriends and any listening ear. You are analyzing every move he made. You want an answer, but there may not be one. You are thinking about all the things he said that turned you on, that sugarplumfairy! still turns you on. And it’s so wrong, but you are a girl and you get emotionally attached. He could be with someone new right now, but you don’t care. You still think about him. You think about him first thing when you wake up in the morning. You think about him last thing before falling asleep at night. Every song on the radio reminds you of him and you relate to the lyrics as if they were written just to describe your situation. You know what? It’s not emotional attachment. It just is. Right now you are wondering if he misses you just as much as you miss him. Does he care about you just as much as you care about him? You want to wear his old shirt to bed and throw it away at the same time. You drink alone because you think your girlfriends are tired of talking about him, but you still need some way to forget. You go to places you used to go with him because you think what if you just happen to see him there and get a chance to reconnect? But you never do run into him. You wonder if that’s the universe trying to tell you to move on. You are moving on. You’re just not fighting not moving on anymore which is moving on. You will be fine again. I promise you will find that time is not the only thing that will help you be fine again. Time is the only thing that sobers you from a night of drinking. He was not your Everything. How can he be? You were someone before he came along and you are still someone now, while he’s gone. It’s not just something you need to believe in. It’s a fact. Even if he’s with someone new, let her deal with him. Let her deal with his drinking habits, his inability to fasten the seatbelt, his yelling, his failure to listen. Let her deal with it. It doesn’t mean there won’t be a time when they find each other apart too. And who says he’s the only one allowed to have someone new? You can too, though maybe not right this second. But being without someone new doesn’t make you any less you. You are more you without him. You will be fine again. It’s not something people say all the time to make you feel better, but secretly don’t believe. It’s a fact. And it demands your attention and care. When I was growing up, I didn’t think about the future. I just wanted to get good grades and keep my parents happy. But after I started college, I realized there were so many things I wish I could have shared with my younger self from what I learned after starting college that might have turned me into a different, prepared-for-life kind of girl (not that such advice or anything could really prepare you). Of course if I had followed every single one of these tips, there’d be no stories to tell. Nevertheless, here they are, things I wish I had known growing up. 1.) Have a practical pursuit and a passion pursuit. A practical pursuit like computer science will make sure you can pay the bills. A passion pursuit is your dream, something artsy you want to become that may not pay the bills right away like becoming an actress. Your practical pursuit will be your backup plan in case you don’t get your dream job right away. You can keep supporting yourself while you continue to pursue your dream job on the side until you can do your dream job full-time. 2.) Learn how to do laundry and keep your room organized and clean now. When you’re living on your own, a dirty apartment can cause health problems if for example, you let mold grow. An organized room allows you to find everything: “a place for everything and everything in its place.” And most importantly, you’ll always know where your keys are! 3.) Listen to your parents. It may not be the “cool” thing to do, and this doesn’t mean you have to obey every single thing they tell you, but make note of their advice. Write it down if you have to because their advice comes in handy later in life and it may not seem like it now, but you will appreciate it in the future. 4.) Be a good listener. It’s easy to want to talk about yourself when you’re making new friends, but listening is an invaluable skill that will help you tune in and soak up the best advice for yourself at the same time. Don’t be afraid to make friends with someone outside of your age group. It’s never too early to get good life advice. 5.) Start working on your passion early! If you do dream of doing something artsy in the future, start entering contests now or starting a YouTube channel or any platform that showcases your work. That way, you may not need to worry about a practical pursuit later. 6.) Learn at least one easy favorite recipe from your mom or dad. When you go away to college or leave home, you can cook your favorite food when you miss it or crave it and even have something to bring to a potluck if presented the opportunity. 7.) Ask questions. That’s one way to spark your curiosity and may even lead to what you want to do with the rest of your life. Learning doesn’t end in school. 8.) Quality of friends is more important than quantity of friends. It may seem like the most important thing right now to be popular, but seriously it is more beneficial to form strong bonds with a few good girls now to have that support system than to spend time getting to best friend status with every person you meet. 9.) Don’t shy away from boys. They are human just like you! Talk to them just like you would talk to any of your friends. Pay attention to them paying attention. If they look bored, change the topic or it might be a sign to end the conversation. Practice talking to them and getting to know them as people first before thinking about making them boyfriend material. 10.) Learn how to be happy being single. Getting a boyfriend at this age is not necessary. There’s nothing wrong with experimenting with dating, but if you don’t find a boyfriend, it is no big deal. A relationship shouldn’t be the center of your happiness. Spend time by yourself to get to know yourself. Later on, you’ll be thankful and know exactly what you’re looking for in a partner. I wanted to share this video with you guys so you can see one of the events I attended recently as part of my journey as a crazy writer. 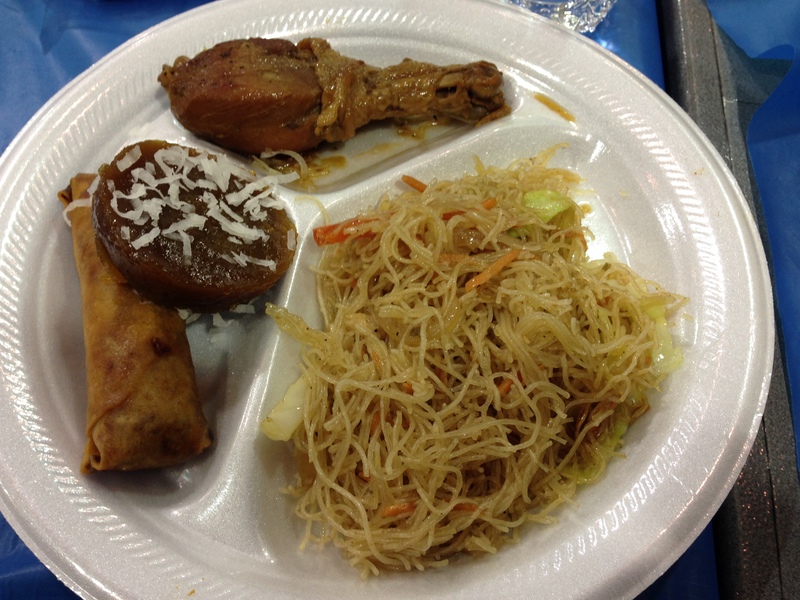 Merj was the keynote speaker at the 2nd Annual Filipino American History Month Celebration. The theme was “Bridging Cultures–Making History for 427 Years.” She took me and a friend of ours, Nadege Uwase, to experience this cultural event in Jefferson City. In the video clip you’ll see the singing and dancing we got to enjoy while we ate our dinner. You’ll see some traditional Filipino dances and costumes. And of course no trip to Jefferson City is complete without a little Central Dairy. We visited the ice cream shop the next day. It was Merj’s first time and there was no way Nadege and I were going to let her miss out on one of the best places in Missouri to get ice cream. You’re being judged all the time. Whatever I say or do, someone has a reaction if they are around. If no one is around, someone would have an opinion about it if I tell them later or they find out later. A lot of times, if I say something, I can see a person’s immediate reaction on their face. (They always have one, whether you catch it or not.) Judgment. And it doesn’t have to be a negative thing. I think there can be good judgment too. But it seems to me sometimes it’s easier to stay home because we don’t want to face any kind of judgment. We don’t want to see someone’s disappointed reaction on their face. We’d rather commit whatever sins in private and then not talk about it again because we know it’s something we cannot control of ourselves and we don’t want judgment for it. But the question is, that thing you do in private, would you be afraid of your spouse finding out? Would you be afraid that that person would not love you anymore if they found out? Someone probably has a judgment for that as well. Maybe it questions the whole concept of loving someone unconditionally. Because there has to be some moments always hidden from our spouses. I’m sure some actions are harmless. Some, however, if found out, can lead to a divorce. Are humans really capable of unconditional love?